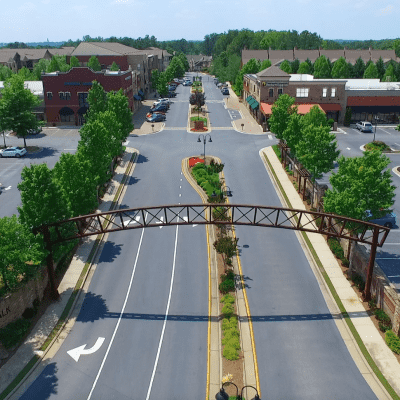 Johns Creek has received national recognition for being one of the best cities to live in–and it’s no surprise why. With 82,000 residents, John’s Creek is the safest large city in Georgia and home to some of the best schools in the state. The area constituting Johns Creek originally belonged to the Cherokee nation. In the early 1800s, European settlers colonized the area and set up trading posts for pioneer families to meet and exchange goods. The first mention of Johns Creek as a place wouldn’t occur until the late 20th century when a group of Georgia Institute of Technology graduates purchased land for an office park. The city of Johns Creek was not officially established until December 1, 2006. Since 2009, the Atlanta Athletic Club has ranked in the top 10 country clubs in the nation. The Club houses two championship golf courses, 42,000 sq.-ft. athletic center, indoor-outdoor tennis courts and much more. In addition to the many amenities, the Club serves as the community’s premier social hub. With ornate club rooms, dining facilities and ongoing events, members are sure to enjoy this uniquely Johns Creek experience. Shop for fresh produce at the John’s Creek Farmers Market held Saturday mornings (May 6 - Aug. 26) from 8 a.m. to 12 p.m.